In Rotorua, there was a road called EAST and that is what I took. The landscape looked tranquil, with paddocks made up of drying maize. Yet I thought to myself how often taua, or military parties, had filtered through the landscape, quietly on their way to a killing. Below is Hongi's track - the track Hongi Hika went on with his death-missions against other Maori tribes in a slightly earlier period. Below is a memorial to the South African war which I found in a small settlement. You know you are travelling out into a strange trajectory of space when you find your car bumping along a one-way bridge which is shared by a train. I am a citydweller, at home on the pavement. I also grew up by the sea and I find being landlocked claustrophobic. It makes me uneasy. Finally I hit the very beautiful Bay of Plenty. In the past it was called the Church of St Stephen the Martyr. This was because the minister of the church, a German called Carl Sylvius Volkner, was caught up in the crossfire of a vicious war. In March 1865 he was hanged near the church, then decapitated and his head was brought into the church. His blood was drunk from a chalice and Kereopa Te Rau, a Maori from another tribe, ate Volkner's eyes. It was a time of war, of the madness which is war. Now the church appears peaceful, and I was fortunate enough to visit it with the young adults of Gisborne High School. I sat through a talk given by John McLeod, the property manager. His talk was a model of balance, contextualisation and explanation. The church now proudly displayed the apology to Mokomoko, a local Maori chief who was hanged because his rope had been used to hang Volkner. The thing which fascinates me about this episode is that, although over 200 people were eyewitnesses, it now appears that nobody saw what happened. Nobody appears to be responsible or own responsibility for it. Kereopa Te Rau who was also hanged for the killing was, according to a piece of writing on the wall of Auckland Art Gallery, hanged on insufficient evidence and he was not responsible for Volkner's killing at all. The other thing which fascinates me is the downgrade of Volkner from martyr to spy. Today his killing is explained by the fact that during war he was acting as a government spy, sending information on 'rebel' troop movements to Governor Grey. This is what it now says on an information board outside the church and the property manager mentioned it in his talk. Poor Volkner. No longer even a martyr. The church has evidence of both points of view. In the porch is the official documentation of Mokomoko's pardon. But there is also the elegant marble sarcophogis under which Volkner's body lies. That is, his headless body. His head was taken elsewhere. This is the story, at the very least, of missing body parts. (After Kereopa Te Rau was hanged, he asked local Maori in Hawke's Bay to spirit away his body and bury it in secrecy.) So he is, to a degree, also 'a missing body part'. These wandering, dislocated souls stand as a metaphor for incomplete business, for things which are disturbed - for things not being reunited. I took photos, as I normally do, hoping to find some kind of truth in visual reality. This is the chalice, a simple, even poor quality one made of pewter, which held Volkner's blood. In a form of Christian communion, in which wine substitutes for Christ's blood, here Volkner's blood was literally drunk. Here is the ledge on which Volkner's head sat, eyeless. Historically Volkner's martyrdom was expressed through the blood which soaked into the wood. Was this a blood stain, I wondered? It is a strange mixture of sacred site, tourist trap with some of the weird attraction of Madame Tussauds (given that she started off by doing waxworks of beheaded French aristocrats.) It is a special - haunted - place. The following morning I had communion at the Church. Through some species of chance I ended up sitting just where Volkner's body lay. I suddenly had a vision of a headless body under my feet and a feeling of nausea swept through me. I had communion, remembering all the old lines and responses. But now, instead of prayers for the Queen we prayed for the land claims of the local tribe, Ngati Whakatohea who had suffered vast confiscations as a punishment for Volkner's death. After the service, which I found moving, I had a cup of tea in what passes for the vestry - the back of the Anglican op-shop. I explained my presence: how William Colenso had written a defence of Kereopa Te Rau at the time of his capture, saying so much devastating confiscation had happened, that the bloodshed had to stop. Colenso said that there was a context for the land wars that Pakeha had to understand. He might as well have whistled into the wind. Or gale, as it was at the time. Once upon a time, Colenso's point of view might have caused unease in something as inherently conservative as an Anglican church. 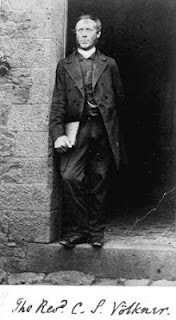 But these days, the people agreed his point of view was just and they kindly allowed me to take a photo of the attendants at communion and the vicar, Arthur Bruce. I tried to get in ' The Lord is My Shepherd, I shall not want ' which lay over the small feast which had been provided at 11 o clock in the morning. And the lady in yellow noticing I had a bad cold gave me a bag of feijoas which are full of Vitamin C.
I set off the following day from Opotiki. These are two shots of the riverine town. It was on this river that Volkner, carrying food for the hungry and medical supplies for the large numbers of people struck down with influenza, was captured. He was seized and with what seems a curious civility and calm, he was shaking hands with the people who surrounded him when the rope round his neck yanked him up the willow tree and his slow strangulation began. I asked local people where the willow tree was. I had read in an old local history journal it was behind what was then the local post-office. Like all small towns, this one-time focal point had been gutted. Someone pointed me in the direction of an electrical shop. And finally this is the headstone created by Mrs Volkner and friends. She had asked the government for financial assistance after Volkner's death. It would create 'an unfortunate precedent'. Fortunately, that bridge hasn't had trains run on it for years. Which, now that I think about it, is a little bit sad rather than fortunate. After searching the complete directory,finally I've found the perfect lender's firm for our problem solution. We need church loan and so want a firm which will charge us fair and have expedience over solving problem like ours. I've found so. Many think that church mortgage for church construction is risky but it's a myth now. Everything in the world doesn't go with the same flow. There're reliable sources like Griffin Church Loans for mortgaging churches and getting loans.